If you're a steel-cut-oatmeal lover who doesn't always find time to prepare your oats, this recipe — and a microwave — can help. You make the oatmeal on Sunday, chill it in a baking pan, and cut bars to eat throughout the week. 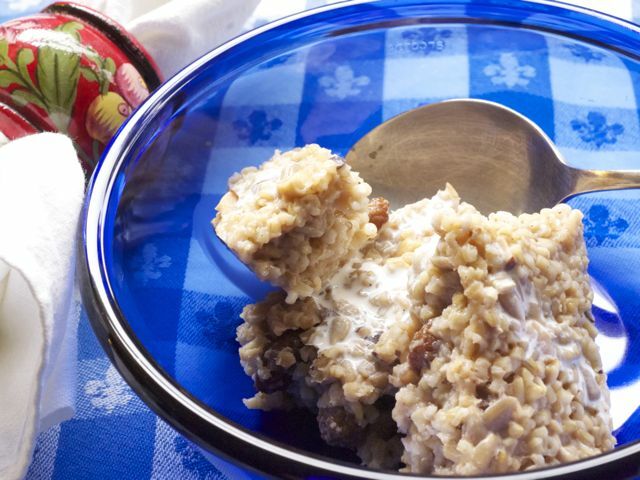 The recipe is based on one from Cooking Light magazine, which recommended serving the oatmeal chilled. In a large saucepan, bring the water, milk, brown sugar, cinnamon, and salt to a boil over medium-high heat; watch it closely to prevent it suddenly boiling over. Stir in the oats and dried fruit; as soon as it begins to simmer, reduce the heat and cook it, stirring occasionally, until it thickens, about 20 minutes. While the oats cook, lightly coat an 11-inch-by-7-inch baking dish with oil or butter. When the oatmeal is ready, stir in the nuts and seeds. Spoon the mixture into the prepared pan and let it cool a bit. Cover and chill. To serve, cut the oatmeal into squares. Place one or two squares in a bowl, and heat in the microwave until it's just warm; serve topped with more milk or a splash of cream if you wish.